Successfully Added HK Warehouse Ulefone Metal Android Smartphone - Octa-Core CPU, 5 Inch Display, 3GB RAM, Android 6.0, 4G, OTG, Dual-IMEI (Grey) to your Shopping Cart. The Ulefone Metal is a gorgeous sleek smartphone that holds a beautiful 5 inch HD Display. With its IPS technology this stunning screen portraits colors vividly, providing truly stunning and detailed imagery. So head out to the play store or stream your favorite movies online – with this Android smartphone you will be able to enjoy a true cinematic experience from the palm of your hand at any time of the day. Coming with the possibility to add up to 128GB of external storage this Chinese smartphone offers plenty of space to store all your favorite media that can now be easily carried around in your pocket no matter where you’re headed. Running on an Android 6.0 operating system the Ulefone Metal 5 provides you with all the latest smartphone features you are used to and lets you enjoy an incredibly smooth user experience. Packing an Octa-Core CPU that has been clocked at 1.3GHz along with 3GB of RAM this Chinese smartphone is more than sufficient to perform daily tasks such as browsing the web, multi-tasking, gaming, and watching movies alike. With its 2050mAh battery, this Android phone provides you with 8 hours of continuous usage time – enough to get through the most demanding of media filled days without needing to worry about running out of juice. 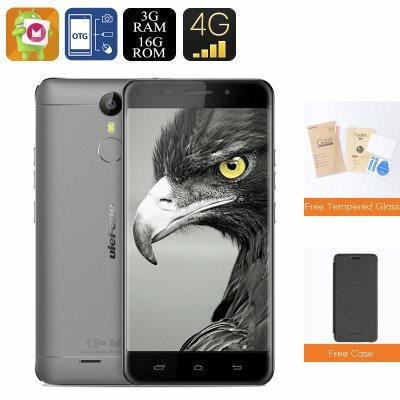 Supporting 4G connectivity the Ulefone Metal is an Android phone that lets you enjoy a smooth and fast mobile connection at any time of the day. Browse the web, stream movies, or chat with friends online – when using this Chinese smartphone a slow internet connection will be an issue of the past. With its Dual-SIM and IMEI numbers, the phone allows you to be connected to two providers simultaneously. Not only does this provide you with the perfect cell phone that can be used to easily separate your work and private life, it also gives you the option to be connected to two different 4G networks – immensely increasing your overall connectivity ensuring that from now on you’ll always be connected and within reach no matter where you’re headed. With its metal body, this Android phone by Ulefone truly features a stunning design, giving it the high-end look it deserves. Featuring the IMX 146 camera that adopts Sony's 3rd generation of CMOS technology the Ulefone Metal lets you snap breathtaking pictures. Additionally, the phone also features a front camera that offers the perfect snapper for all selfie lovers out there and opens up the way for hour’s worth of online video conversations with all your friends, family, and loved ones. The Ulefone Metal comes with a 12 months warranty, brought to you by the leader in Android phones as well as wholesale electronic gadgets..